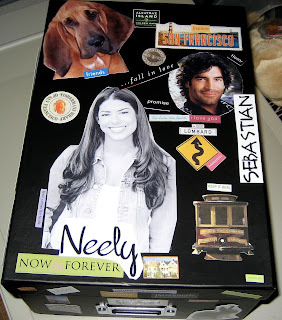 I sent a pic of Sebastian and Neely's box to Anne Gracie, and she wrote back and said, "A 3-D collage!" Well, yes. But even better, I can put stuff in it rather than have to worry about how I'm going to store it eventually. And as I add more stuff to it, I'll be able to keep it all in one place, she said hopefully. 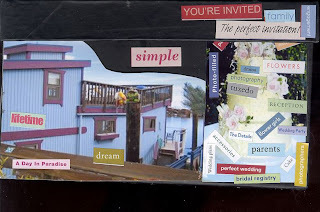 Can you tell I am organizationally challenged? But I like the box. And, who knows, I may even paper over some of the bits that are inconsequential later but seem to set the scene now. I did that already with a pic of Alcatraz. I started with to remind me of SF and the bay. But as I got more stuff about the book, it vanished beneath Harmon the bloodhound. If you look close you can see a bit of it peeking out from behind his left ear. I'm not sure about my Lombard Street road sign squiggle yet, either. That might vanish, too. It is a place holder right now. But I found Neely. I'm so pleased with her -- though I only have the one picture of her. But then I only ever had one pic of Theo and it sufficed. I think I may have two of Sebastian. Don't know yet. The rest of the gang is assembling -- the kittens, the rabbit, the guinea pig. His name is Howard. The rabbit is G race. I don't know about the kittens' names yet. I just managed to give Sadie the kitten a name in 'real life' for Mads (no, not that Mads!) but do you think I can name five of these guys? Not a chance. Maybe we should have contest -- A "Here Come the Kittens" contest! What do you think? Perhaps I could talk Theo into coming back to run it for me. I need to think of a prize -- or Theo does. And you all need to start thinking of names for kittens. Hi Anne, I couldn't name my own kittie but, I thought of some ideas for your little ones, thanks to the help of my son and his girlfriend. Here goes: Bo, Prinny, Hazel, Tuffy, Sprigger, Deeogee(DOG), Meeoff, Swatter, Squeeky, Masher. I hope this helps at least a little bit. Sadie the cat is doing fine and, learning to cat fight in the middle of the night. Thanks to her big sister Stinky the cat. I'll send you a picture of Sadie soon so you can see what she looks like. You helped me name a very beautiful cat with aqua eyes. I like Swatter, Mads. Thanks for all the names. I'll see what we come up with. Christa, you're right. Theo probably has enough to do. And Sebastian is his cousin, so Theo and Martha and Ed and Ted will drop by and Theo can teach him how to run contests (and write on blogs). Somehow I don't think Seb is a 'writing on blogs' sort of guy. He'd probably send memos and lists. Hmm could he recruit Neely to help write on blogs?